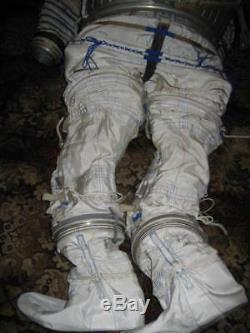 Original Russian Soviet Cosmonaut Space suit ORLAN-M EVA ISS Extra Very RARE. "Orlan" is the Russian word for "eagle". 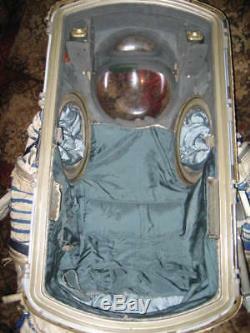 The Russian corporation "Zvezda" developed this space suit "ORLAN M" for the Russian space programme in early 1970 f? As the race to space was ended after the landing of Apollo 11 in the "sea of silence" on the moon surface on july 20th 1969, Russians stopped their moon program 1971 and developed the space suit for other activities as like spacewalks outside from space stations and space-ships. It became easier and more mobile. Since 1971 the Orlan was used since beginning of the Salyut space stations. The "Orlan M space suit" (M means here "modernized") that is presented now here, represents the last developing-step of the famous Russian space suit. The Orlan-M is an improved version of the previous spacesuit, the Orlan-DMA. It can accommodate a greater range of anthropometric sizes (165 cm to 190 cm). Radio communications have been modified so that two cosmonauts can speak and listen to each other simultaneously (which they couldn't in the previous Orlan version). The metallic cuirass (the suit's hard aluminum-alloy torso) is increased in size as are the arm and leg openings for the greater range of wearers' heights. On the cuirass are fixtures for attachment of the USK, Cosmonaut Self-Rescue Device. The Orlan can be used in both the Pirs and U. EMU can only be used in Quest of the International Space Station ISS. The drawback is that the higher pressure means that the Orlan is somewhat more difficult to move in. The Orlan operates at a pressure of 0.4 atmospheres EMU at 0.3 atm. , enabling a pre-breathe time of only 30 minutes (in the EMU pre-breathe is 12 hours in the Joint Airlock, or 4 hours in the EMU itself). The Orlan M space suit is very easy concepted: Through the its back the cosmonaut get into the space suite. All vital equipment is in the space suit on the back of the suit, however inside - e.
Fans, water pumps, pressure control valve, oxygene tubes and radio communication system. Each of the articles of equipment has a 1:1 back up system, i. If one of the vitally necessary systems should fail, immediately a duplicate takes over the supply. Technical datas of the "Orlan M space suit". Nominal duration of the autonomous mode: 7 hours. ORLAN-M spacesuit absorption cartridge operating time (with airlock time included): 9 hours. Suit positive pressure: nominal mode 392 hPa - emergency mode 270 hPa. Oxygen available (main and back-up): 1 kg each. Cooling water available: 3.6 kg. Assured heat removal: average 350 W - maximum Up to 600 W. Total consumed power by the suit systems: Up to 54 W.
Quantity of telemetry measured parameters: 29. Spacesuit weight (wet): 112 kg. Service life: Up to 15 vykhody (EVAs) over 4 years (no return to the Earth). 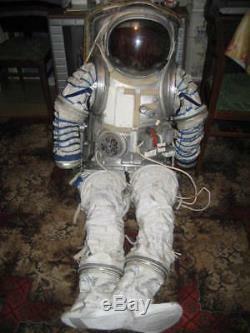 The presented space suit is for sale. The Orlan M space suit is manufractured in the year 2003 by Russian Corporation "Zvezda" and full under function. There may well be additional examples now in museums, but as near as we can tell, this is the only example presently on the open market and available to collectors. This is an important opportunity to acquire a key part of space history. Good condition - see photo for details. A PIECE OF COLLECTION - HAVE A LOOK! A GREAT FIND FOR THE SERIOUS COLLECTOR. DON'T MISS YOUR CHANCE TO BE THE OWNER OF SUCH UNIQUE ITEM! Note: This is NOT a reproduction. We only sell ORIGINAL FIRST ISSUED of items. Feedback is very important to us. The item "Original Russian Soviet Cosmonaut Space suit ORLAN-M EVA ISS Extra Very RARE" is in sale since Monday, September 24, 2018. This item is in the category "Collectibles\Historical Memorabilia\Astronauts & Space Travel\Russian & Soviet Program". The seller is "kosmodrom68" and is located in Moscow, default. This item can be shipped worldwide.